Become one of the most sought-after guests in your circle and be asked back time-after-time with a little bit of help from Elizabeth Heiskell. It is usually the first question you ask after receiving an invitation to a gathering or event: "What can I bring?" Now you'll have the answer Based on the popular monthly feature "What Can I Bring?" in Southern Living magazine, no matter what the occasion, you'll have the perfect dish. 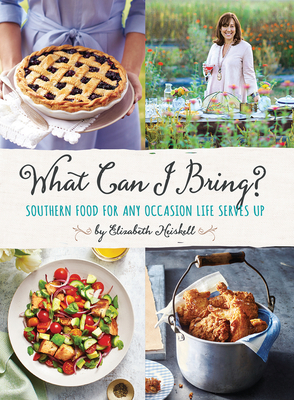 From housewarming party to garden party, a new baby, a wake, a wedding, christening or anything in between, Elizabeth delivers over 100 delicious recipes, including appetizers, mains, sandwiches, desserts and more, that are sure to please a crowd, no matter how big or small. Additionally, these are all dishes that can be prepared in advance and travel well. But let's not forget the most imortant question: What can I bring to my own table? Whether you're looking for some new ideas for dinners to please a fractious family or want to make Sunday brunch a more special event, What Can I Bring? has you covered. Recipes include Elizabeth's take on Sour Cream Coffee Cake (perfect for welcoming a new neighbor ), delicious salads - Chicken, Shrimp, and Pimiento (you won't go wrong at the church picnic), amazing sides, including Lemon Rice and Spoon Bread (perfect for rounding out the potluck table), and comfort food that no one will be able to say no to, including Vegetable Beef Stew, Chicken Pot Pie, and Chicken and Dumplings, plus an array of desserts so good that that's the only thing people will remember about the meal. Above all, these are all delicious dishes, served straight from the heart, with no stress required. Elizabeth Heiskell is a regular food contributor to the "Today" show and a seasoned caterer, chef and culinary instructor. Born and raised in the Mississippi Delta, she grew a passion for combining her love of food and the history of the rich agricultural area she was raised in. Under the brand name The Debutante Farmer, she sells home grown gourmet pickles, jellies, jams, salsas, and her popular Bloody Mary mix.